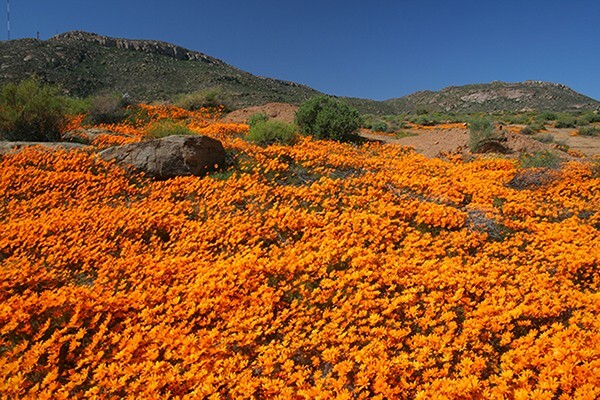 The Northern Cape is shedding its usual arid look and is transforming into a floral wonder. The annual flower season has started early this year and we are looking forward to an exceptional season with carpets of flowers already evident across the province. The colour and variety of the floral displays across the Namakwa will is exceptional and not to be missed. According to Bernard van Lente, park manager of the Namaqua National Park, the extent of flowers this early in the season is definitely surprising. “We had good rain early in March and April with a relatively hot May, which has had a positive influence on the first blooms. There are already a surprising number of flowers in the Skilpad region and 4x4 drivers can also spot a good variety of species and colours along the coastal section from the Spoegriver to the Groen river. Between Garien and Groen River as well as along the road between Garies and Hondeklip Bay, the beetle daisies or Gorteriadiffusa are blooming prolifically,” explains Van Lente. You can also download the Flower Report with information on where to view flowers here.